"Ginger crouton!" "I have a certificate!" "Big, non-threatening grin!" Magnolia Pictures is one of the most interesting distributors working today, putting out awesome foreign films like samurai action tale 13 Assassins, small scale genre flick Monsters, Jean-Claude Van Damme and Dolph Lundgren franchise chapter Universal Soldier: Day of Reckoning, Thomas Jane's adult drama I Melt With You and their latest, the seemingly oddball comedy Frank. Magnolia usually launches films on Video On Demand before securing a few theatrical playdates in random cities then producing special feature heavy DVDs and Blu-Rays. 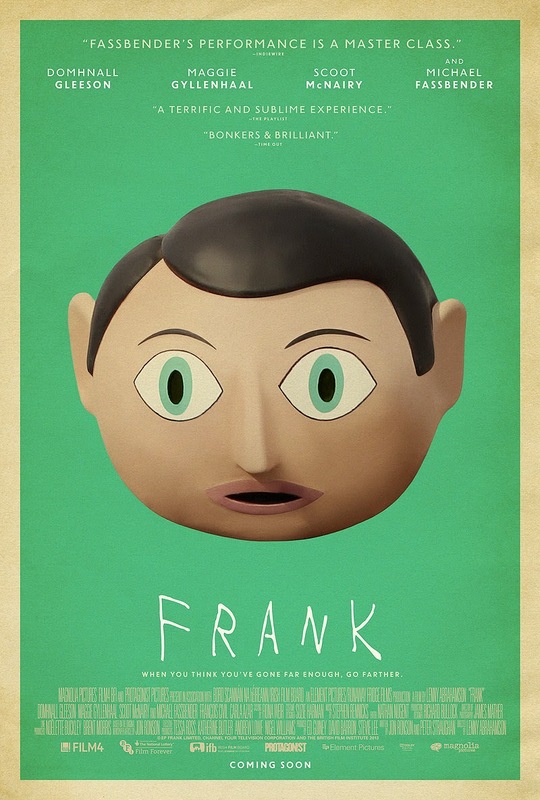 Not having seen a trailer for Frank, the only thing I knew of the film was that it starred Michael Fassbender wearing a giant paper mache head. The official synopsis speaks of a young would-be musician who joins a band led by the eccentric and enigmatic Frank. What actually follows can't be classified as a good or bad film per se but a weird, funny and sad journey/experience. Domhnall Gleeson (About Time) plays Jon, a young man struggling to write music while working a boring office job. 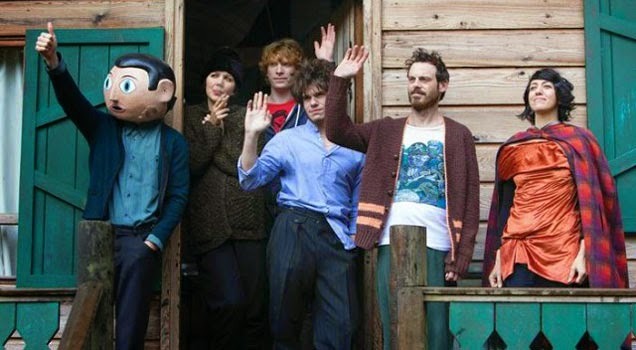 With 14 Twitter followers to his name, Jon comes across Soronprfbs, an indie band managed by Don (Scoot McNairy) that includes members Clara (Maggie Gyllenhaal), Baraque (Francois Civil) and Nana (Carla Azar). When their keyboard player can no longer continue, Don invites Jon to join them that night at a show where we're introduced to Soronprf's unique if not crowd pleasing sound and their front man; the big, fake head wearing and wetsuit clad Frank. The show goes south quickly but Soronprfs is about to record an album and Jon is invited to join. Staying at a remote cabin in Ireland, the band goes through bizarre rituals to try and capture the perfect sound. We learn that Don met Frank in a mental institute, observe Clara's love for Frank and disdain for Jon while the newest band member documents the band's weird and random activities on YouTube and begins to gain a following. It's hard to discuss the film without getting more into the story which would be a bit spoiler heavy. So let's just say that the film takes a look at some real issues that effect the lives of millions without actually commenting on them or offering solutions. Sometimes you just have to let things be the way they are. As Jon gets deeper into the band, mesmerized by Frank's strange yet apparent talent and his own dreams of success, a simple yet familiar story of the grass maybe not being so green on the other side comes into play. What was interesting about Frank was that director Kenny Abrahamson with writers Jon Ronson and Peter Straughan made sure you didn't know which way things were going to go but the end result is more or less satisfying as the journey has taken you from point A to Y back to D etc in short order without cheating the audience. While the film is about a band and there's lot of cues, there isn't an actual soundtrack at play here waiting for you to buy afterwards. Listening to the one full length track, "I Love You All" outside the confines of the film loses much of it's effectiveness but the film stayed with me for a couple of days. "Here it is, my most likeable song, ever." Hi, I'd to talk to you about featuring your work on my site ACTIONAGOGO.COM. I'm following you on twitter, but if you could follow me back @actionagogo we can DM and get a discussion going. Just to let you know how this is not spam, I lift weights too.